For India's poor, the cost of Prime Minister Modi's demonetization policy is steep. On November 8, 2016, Prime Minister Narendra Modi announced that 500- and 1,000-rupee banknotes would cease to be legal tender as of midnight that night. The announcement was made in an unscheduled live television address, giving people only about four hours to make arrangements, if they could. The new policy was intended to shock and it has. In a press release the Reserve Bank of India (RBI), India’s central bank justified the dramatic shift: “This is necessitated to tackle counterfeiting Indian banknotes, to effectively nullify black money hoarded in cash and curb funding of terrorism with fake notes.” This is a laudable goal, but since then the government has changed its story several times, later suggesting that moving towards a cashless society is a primary goal of the policy. The rollout has been chaotic to say the least; between November and December, the RBI and the Ministry of Finance together issued more than sixty notifications on demonetization, a sign of poor planning and a desperate desire to convince. The emphasis on tackling counterfeiting is part of a broader anticorruption narrative in India. Corruption is omnipresent in the country, and public anger is growing. Indeed, scandals over the telecommunications spectrum and coal allocation were a major reason for the defeat of the former government — the United Progressive Alliance (a center-left coalition). The incumbent right-wing Bharatiya Jananta Party (BJP) government has made fighting corruption its calling card; it successfully uses anticorruption rhetoric to appease its supporters and expand its political reach. The demonetization announcement fit this strategy. Operating on the specious assumption that corruption depends on cash, the forced shift to electronic transactions was promised as a technical fix. But there is no technical fix for corruption in India, where corruption is rooted in structural problems: insufficient wages in the public sector at the bottom, and an unholy alliance between big capitalists and the government at the top. Nor is demonetization a simple, neutral fix. 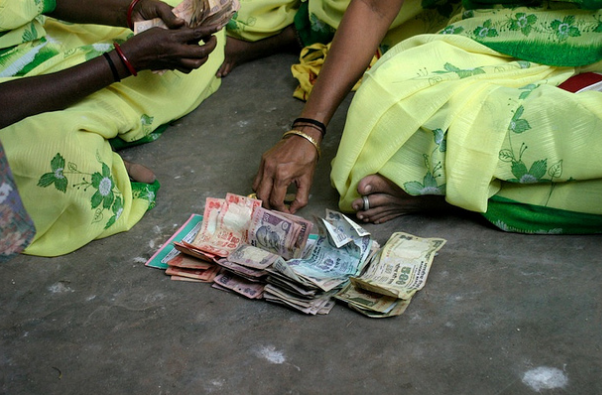 India has a cash-based economy, and 500- and 1,000-rupee notes made up 86 percent of the total currency. The reform has sharply disrupted cash circulation, with the costs falling disproportionately on the poor. The effects were immediately seen across rural India: agrarian distress, unpaid wages, unpaid pensions, declining sales and incomes, and broken migration cycles. Agricultural laborers, migrant workers, pensioners, and informal sector workers (fisher folk, beedi workers, street vendors, etc.) have suffered the most. Hundreds of millions have spent hours waiting in queues to deposit the withdrawn banknotes and to get valid currency from banks and ATMs — often without success. Demonetization affects the rich and the poor very differently. Over the last decade, India’s high economic growth has not translated into a narrowing of income inequality. (The share of wages in net value added has fallen.) In this context, the opportunity cost of time is higher for the poor than for the rich — they have much more to lose from any interruption of work. So having to queue up at banks and ATMs exacerbates inequality. Further, the poor in India, particularly in the informal sectors (agricultural laborers, fisheries, construction, money-lending, etc. ), survive on daily wages. An unexpected cash shortage hits family income and expenditure immediately. Since one’s expenditure is another’s income, the cash shortage has had multiplier effects across the economy, dragging down output and employment. The effects were felt acutely in labor-intensive sectors such as the textile industry. The prime minister and the finance minister have both claimed the disruption is temporary, and large Indian capitalists have echoed that line. The managing director of Mahindra & Mahindra, a key player in the Indian automobile industry, said that demonetization “is not something that is going to haunt us in the mid- to long-term. It is really just a short-term effect.” For big capital this is true. Indeed, the survey-based Nikkei Indian Manufacturing Purchasing Managers’ index saw only a marginal dip in December 2016. But the index only measures output from the largest companies, leaving the negative impacts on the informal manufacturing sector unacknowledged. Painting a picture of future gains, the government and its sympathizers have assured the populace that their temporary hardships will pay off in the long run. But how short is the short run? It might be months, or even a year. If small capitalists in the informal sector are pushed out of business, or get in deep financial trouble, it could have lasting effects on investment and employment. Unlike large capitalists, many small businesses do not have access to the financial resources to help them ride out a storm. Sectors in which output is perishable, such as agriculture and fisheries, have been hit particularly hard. According to the National Crime Records Bureau (NCRB), indebtedness is the main reason for farmer suicides and even a temporary shock — such as demonetization — will have serious long-run consequences. Rural India is already under great strain: 5,650 farmers committed suicide in 2014. The long-run aims of demonetization are also not as noble as they appear. The government’s new story, that it is cultivating a cashless economy, is itself problematic. In theory, a cashless economy could offer widespread benefits, even for the poor. Electronic transfers could be cheaper and more easily monitored. Financiers to the informal sector often charge interest rates above 30 percent while public and private banks lend at 10 percent. In this regard, extending the banking system can be a progressive goal. But the theoretical possibilities of a cashless economy run up against numerous concrete obstacles in Indian society today. For one thing, rural India simply lacks adequate physical and financial infrastructure — pushing people away from cash presumes they have somewhere else to go. Moreover, the demonetization has not been part of a careful plan: the cashless economy seems to have been an ad hoc addition to the initial aims. The poor and vulnerable were not given the notice they needed to make plans. And while the use of digital payments (particularly of mobile wallets such as Paytm) has increased, we still do not know how these financial institutions are regulated or what might happen to people’s deposits if they go bust. Private interests — especially in banking and finance — usually go against social interests. The poor seek the expensive informal sources of credit because they cannot provide collateral but have urgent needs, often for day-to-day consumption and investment. Their dependence on cash only partially reflects the inability of mainstream banking to reach the rural and informal sectors. More important are the uncertain nature of rural employment, the social constraints (e.g., caste, gender) in accessing credit, and extremely low levels of education. Thus, the transition to a relatively cashless economy should be a natural consequence of structural changes in the Indian society — stable employment, decent wages, low inequality (across caste, gender, and class), and high education levels. Instead, the demonetization has been a “reform” in line with other economic “reforms” undertaken by the conservative BJP government, like the party’s disastrous new policy of substituting foreign private investment for public investment as a preferred route to higher growth. Its programs are all characterized by a poverty of economic thinking and a severe lack of understanding, or willful disregard, of Indian socioeconomic realities. These shortcuts to economic development won’t work. Structural problems of unemployment and corruption require structural solutions, which the government is not prepared to pursue. The costs are unconscionable, unleashing hardships on the most vulnerable. This is both a tragedy of our democracy and a failure of political imagination. For India’s poor, the cost of Prime Minister Modi’s demonetization policy is steep.